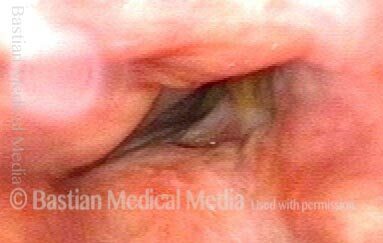 Verrucous carcinoma, left vocal cord, persistent after radiotherapy elsewhere, in a patient unable to undergo general anesthesia due to severe lung disease. After several Thulium Laser ablations, using topical and injected local anesthesia, with patient sitting in examination chair, thereby avoiding general anesthesia. Approximately six weeks later, durable resolution of tumor. 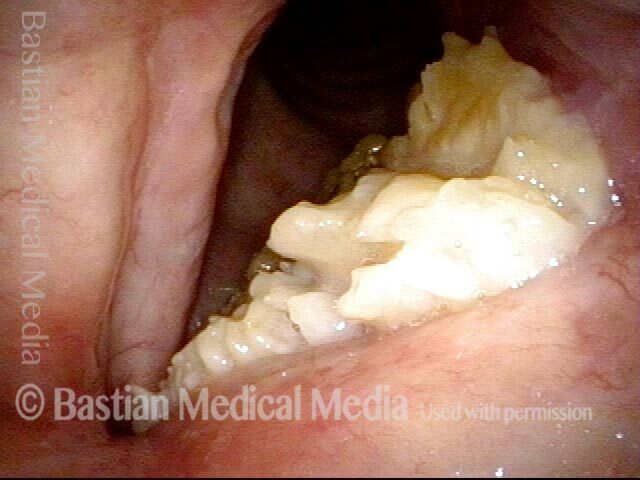 Yellow material is mucus. During voicing. 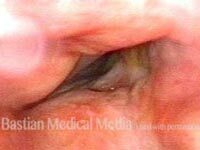 Arytenoid moves, but much of membranous vocal cord has been ablated as intended.